PASADENA, Calif. — An image from Mars orbit taken 10 years after the launch of NASA’s Mars Exploration Rover Opportunity shows the long-lived rover on its trek to a new destination on Mars. 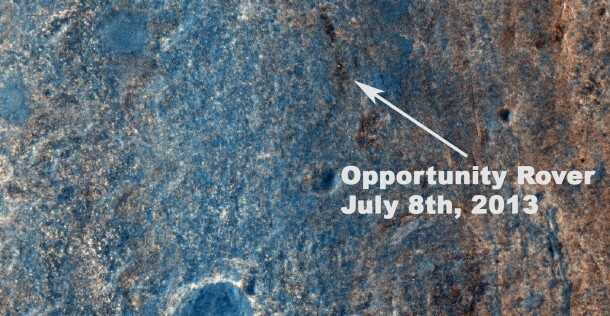 “The Opportunity team particularly appreciates the color image of Solander Point because it provides substantially more information on the terrains and traverse that Opportunity will be conducting over the next phase of our exploration of the rim of Endeavour crater,” said Mars Science Laboratory Project Scientist Matt Golombek of NASA’s Jet Propulsion Laboratory, Pasadena, Calif. Opportunity was launched from Florida’s Space Coast on July 7, 2003, PDT and EDT (July 8, Universal Time). The rover finished nearly two years of investigating an area called “Cape York” two months ago. Both Cape York and Solander Point are raised portions of the rim of Endeavour Crater, which is 14 miles (22 kilometers) in diameter. HiRISE is operated by the University of Arizona, Tucson. The instrument was built by Ball Aerospace & Technologies Corp., Boulder, Colo. The Mars Reconnaissance Orbiter Project and Mars Exploration Rover Project are managed for NASA’s Science Mission Directorate, Washington, by JPL, a division of the California Institute of Technology in Pasadena.